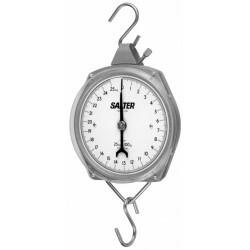 The Salter Brecknell 235-6M Scale is a Compact and robust suspended scale, with 150mm diameter dial. Housed in the traditional metal case. This Scale can be used for a range of different weighing jobs, such as suitcase weighing scales, fishing scales, hooked item scales. Accurate to 1 part in 250 with up to 10% zero adjustment.